I know you've checked out the new 2018-2020 In Colors by now! Well, here's some inspiration for you using Lovely Lipstick. I have an In Color Club every year featuring these beautiful new colors! For just $40 a month, you get a package of cardstock, a marker, an ink pad, the reinker, the coordinating DSP and the 1/8" ribbon. PLUS 3 cards focused on that color! This month was Lovely Lipstick. 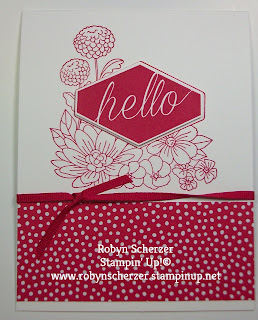 And I featured the new stamp set, Accented Blooms. Its not too late, to get in on the action! 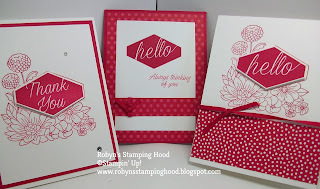 Shoot me an email and I'll be happy to send you a kit including a PDF making these 3 cards. 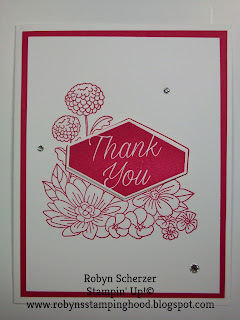 Of course all of these cards were inspired by other talented demos. I just put my twist on them! All supplies are listed below. I'd be honored if your purchased them from me! Happy stamping!